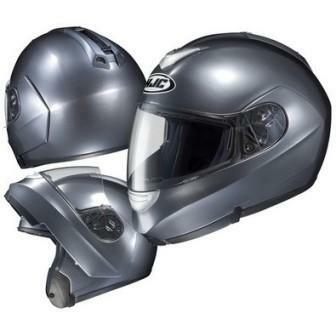 Riders Discount supplied me with an HJC SY-MAX 2 modular helmet to review. The timing is perfect because I wanted to use a full face modular helmet for cold weather riding. So far I have used the helmet on two cold weather rides and the helmet sure does keep my head warmer than my three quarter helmet. There is also reduced wind noise. I like the modular helmet because you get the benefit of a full face but can flip the helmet open when you want to; like a three quarter helmet with a face shield. I was also experiencing helmet wobble with my three quarter helmet when used with my wind shield. The vibration from my helmet was giving me headaches on long highway trips so I was looking for a solution. The more secure full face helmet with cheek pads fits more betterer and the helmet shake is reduced drastically. According to my contact at Riders Discount this is “the hottest selling modular helmet right now.” It retails for $261 and I recommend the helmet for those of you interested in a full face model. This is a high quality product at a reasonable price and is offered in an assortment of attractive colors. I got silver but I wish I got Anthracite shown below. The next generation of the SY-Max is here. Modular design is taken further with the SY-Max 2 by adding the internal smoked visor. This internal visor drops from the forehead area acting like a pair of sunglasses. The standard face shield can be up or down when the integrated sun visor is down. Anti bacterial SilverCool material lines the removable padding for an easy washing and odor free ride. Take all the convenience of a flip up and add the ingenuity of HJC design for great touring helmet. When I asked Dale if he was wearing his HJC SY-MAX 2 when the crash took place he replied “Yeah, I was wearing that helmet. It saved me from becoming a broccoli floret when my forehead hit the pavement.” This helmet works and I’m glad for Dale’s sake that it worked well! I first used this helmet with a neck warmer (like Ann’s Neckie). My face was warm, my neck was warm, but the underside of my chin and jaw was exposed and cold. I tried it with a ZanHeadgear nylon balaclava from JC Whitney but that was too thin and thus too cold. So next I tried the helmet with my neck warmer that has a nylon balaclava style hood attached. This worked. I was finally warm all over! Next I tried using the nylon balaclava with the ZanHeadgear neck warmer in combination. This combo was just as warm but more comfortable. Something inside the helmet seems to be rattleling a little bit. Perhaps part of the integrated sunshield mechanism. The clear flip up face shield has a tab that you can use to flip it open (which you must do at red lights to keep the shield from fogging). My only real complaint about this helmet is that the tab is on the left side. This drives me crazy! I am not left handed and I don’t take my hand off the clutch at stop lights because I keep the bike in gear in case of emergency. Why not put the tab on the right side or both sides? that would be much better! Then I could flip the shield open easily! Glimmerman thinks I look like Rick Moranis in Spaceballs while wearing this headgear.